Present year around, Red Drum “Redfish” are the most common of all gamefish species in Myrtle Beach. We target reds in a number of different ways but light spinning tackle and light fly fishing gear will give you an exciting fight. We also target the Bull Reds during spawning events in late summer and fall. Spawning aggregations occur near estuary inlets and passes along barrier island beaches. Males produce drumming sounds using muscular contractions to vibrate the swimbladder, to attract females. 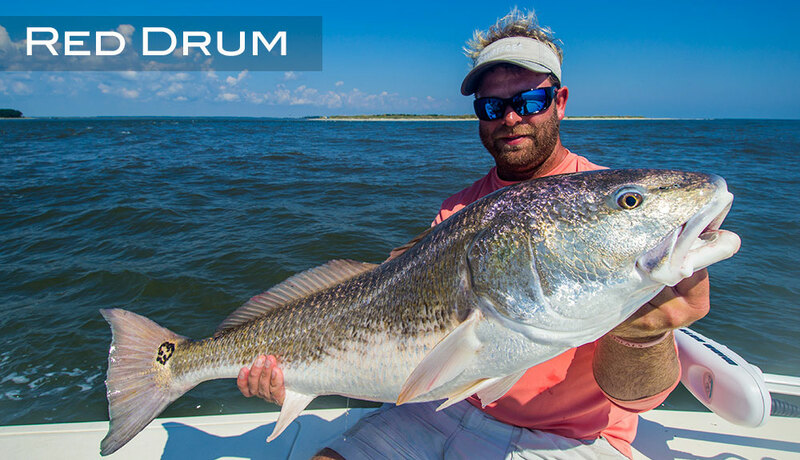 Surf Fishing for red drum is very effective if you can access some of the remote barrier islands that lie just to the south of Myrtle Beach. Fall and Winter is an excellent time of year to target reds in shallow water as they school up in big numbers, some of the best sight fishing occurs during this time.